Cate Gillon/GettyMillennials love prepared food and spend the least amount of time on meal prep. 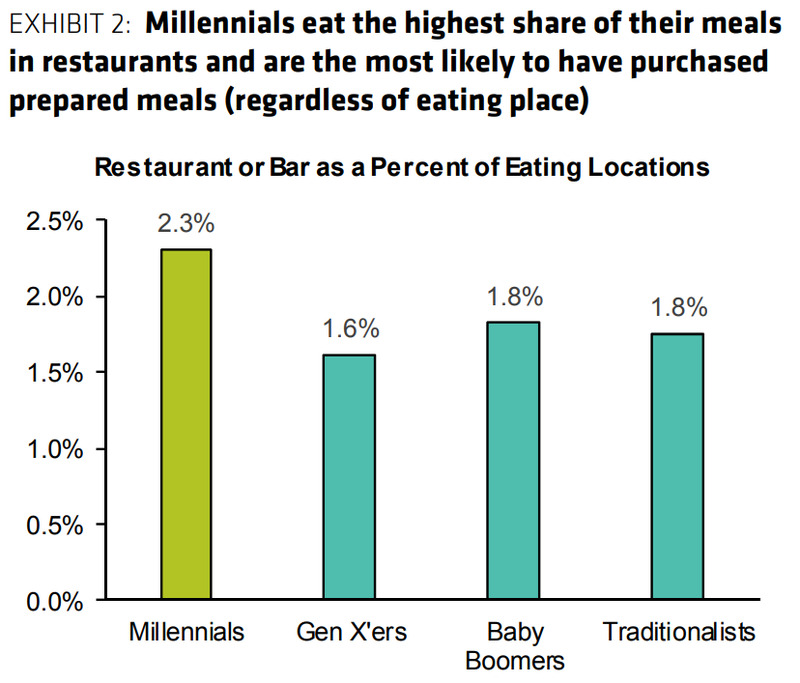 Millennials’ preference for eating out reflects a second point of departure from their parents: They’re less willing to cook. 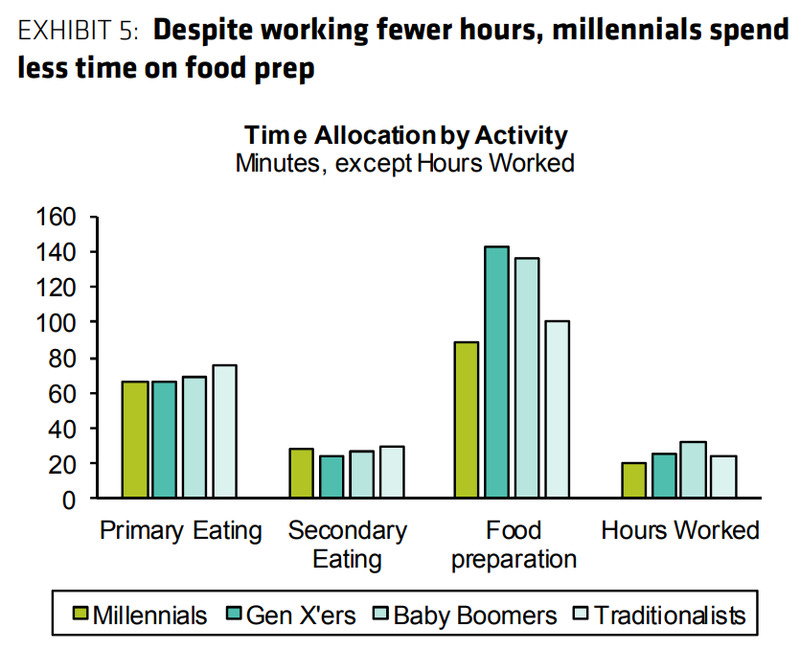 Bernstein found that even though millennials work fewer hours than older generations – including those who have retired – they spend the least amount of time on meal prep. That’s a big opportunity for the $US56 billion catering industry. Fast-casual restaurants like Chipotle, which are well frequented by millennials and have executed a catering strategy, made a “well-placed” decision, the analysts said. 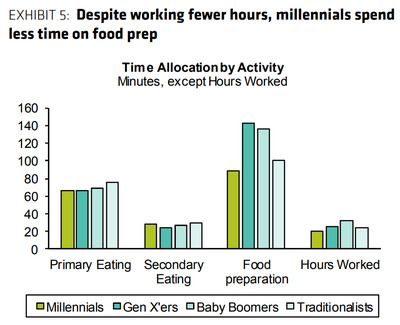 “It’s not surprising to find then, that millennials allocate the highest share of their food budgets to prepared food (7.5% vs 6.6-6.9% for the other generations),” they added. “At each income level, millennials spend the highest shares of their budgets on prepared foods, sugar and sweets, and pasta, and the least to grains – arguably the least processed of the processed foods,” the Bernstein analysts said. Millennials apparently also find it more inconvenient than any other generation to shop around for coupons. According to the USDA’s study, about 6% of their spending is from coupons, versus nearly 8% for baby boomers and Gen. X’ers. 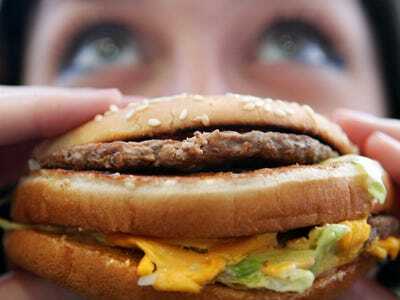 That’s why price-specific offers like McDonald’s$US1 $US2 $US3 Dollar Menu can help to drive sales. 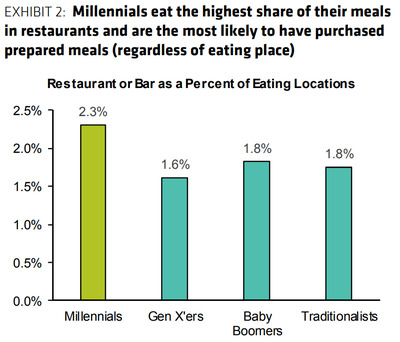 However, the USDA’s original report observed that cost ultimately played a bigger role: Millennials whose wage growth has been hurt by the recession also like convenience, but cook when it’s cheaper than eating out.